Mohammed bin Salman has “staked his entire reputation on being able to be the one person in Saudi Arabia who can transform the kingdom economically." LONDON — Next week's glittering economic conference in Riyadh is meant to showcase the best of modern Saudi Arabia. Instead, the disappearance of Saudi journalist Jamal Khashoggi has led to an exodus of international A-listers from what is called "Davos in the Desert," potentially undermining the event. The Khashoggi case itself also threatens to derail Crown Prince Mohammed bin Salman's international effort to rebrand the kingdom. In the past days, a slew of business leaders announced they would not attend the second Future Investment Initiative. Larry Fink, chief executive of BlackRock, the world's largest fund manager, and Stephen Schwarzman, CEO of the huge private equity company Blackstone, on Monday became the latest executives to withdraw, according to Reuters. JPMorgan Chase CEO Jamie Dimon and Ford Motor Chairman Bill Ford said Sunday they would not participate in the gathering, following a long line of media executives who pulled out last week. Cancellations could pressure other firms to follow suit, with all eyes on Goldman Sachs, Mastercard, Bank of America, Citigroup and Credit Suisse. 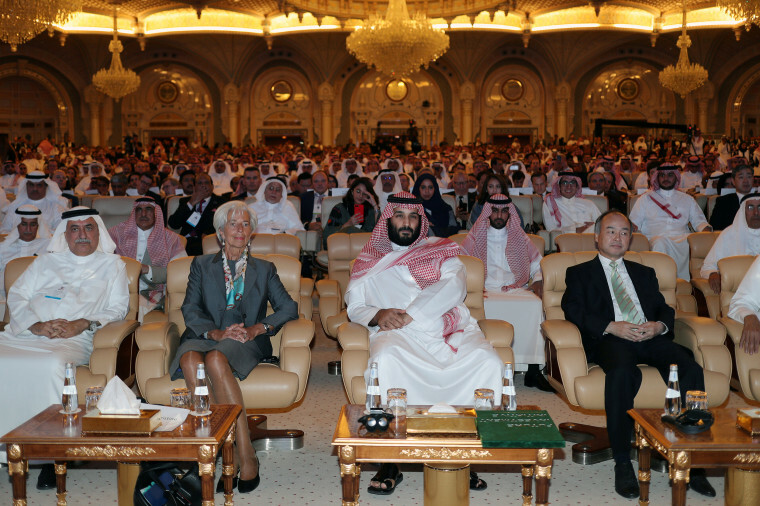 The three-day conference, scheduled to start on Oct. 23, is the centerpiece of the crown prince's plan to diversify the country’s oil-dependent economy, reform its deeply traditional society and revamp its international image. While loosening the hold of the country's feared religious police and allowing women to drive, the powerful crown prince has also overseen a widespread crackdown on dissent. Khashoggi, a critic of the government who last year left Saudi Arabia and began writing pieces for The Washington Post, vanished on Oct. 2 after entering the Saudi consulate in Istanbul. This created a major diplomatic crisis for the kingdom, with mounting evidence that the Saudis were involved fueling a growing outcry from foreign governments, U.S. lawmakers and the Trump administration. Turkish authorities have told U.S. officials that they have recordings from inside the Saudi consulate in Istanbul that prove Khashoggi was killed inside, officials told NBC News. Riyadh has strenuously denied these reports. Kristian Coates Ulrichsen, a fellow for the Middle East at Rice University’s Baker Institute for Public Policy, warned that the reputational cost of doing business in Saudi Arabia could spike in the wake of Khashoggi's disappearance. “We’ve already seen how quickly people have pulled out of the Future Investment Conference,” he said. “He’s staked his entire reputation on being able to be the one person in Saudi Arabia who can transform the Kingdom economically. He’s made that his signature,” he said of the crown prince, who is 33. President Donald Trump, who along with Jared Kushner, his son-in-law and senior adviser, has embraced the crown prince as a close and crucial partner in the administration's Middle East strategy, said Monday that King Salman had denied any knowledge of Khashoggi's whereabouts, and that he was sending Secretary of State Mike Pompeo to meet with the Saudi leader. “Just spoke to the King of Saudi Arabia who denies any knowledge of whatever may have happened ‘to our Saudi Arabian citizen,’” tweeted Trump. Saudi Arabia was his first foreign trip as president. Over the weekend, Trump warned of “severe punishment” if it turns out that Khashoggi was killed inside the consulate. “The kingdom affirms its total rejection of any threats and attempts to undermine it, whether by threatening to impose economic sanctions, using political pressures, or repeating false accusations,” read a statement carried by the state-run Saudi Press Agency. Arab nations followed up, releasing statements in support of Riyadh, with Bahrain's foreign minister calling for a boycott of the ride-sharing app Uber, after its CEO, Dara Khosrowshahi, pulled out of the conference. Khalaf Ahmad Al-Habtoor, an influential United Arab Emirates tycoon, called for an Arab boycott of all U.S. firms who have withdrawn from the conference. In contrast, last year's Future Investment Initiative was attended by former French President Nicolas Sarkozy, former U.K. Prime Minister Tony Blair, Treasury Secretary Steven Mnuchin and International Monetary Fund Managing Director Christine Lagarde. Despite the mass withdrawals from the private sector, Mnuchin confirmed Friday that he plans to attend, saying he wanted to visit the Terrorism Finance Targeting Center, which is based in Saudi Arabia. Last week, U.S. mass media conglomerate Viacom Inc CEO Bob Bakish and billionaire Steve Case said they would not attend, and CNBC, The New York Times, The Financial Times and Bloomberg also withdrew. On Monday, Saudi Arabia’s currency fell to its lowest level in two years over fears that foreign investment inflows could shrink. Oil prices also rose with Brent crude oil jumping $1.49 a barrel to a high of $81.92 before slipping to $81.13. Technology company SoftBank saw its shares drop as the fallout spread to the Japanese conglomerate whose nearly $100 billion Vision Fund is almost half-funded by Saudi Arabia.